And I followed up with more details posted on Facebook. My friend Sheri Tindle asked how it happened. I attended the NC Democratic convention, though I didn’t have a vote because I hadn’t figured out how to apply to be a delegate. When they were collecting nominees for the Electors, I tried to volunteer, but had no standing to do so… so one of the delegates sitting near me jumped up and put my name in. I think I won a slot because my county (Orange) is a Democratic hotbed in NC. I was originally chosen as an Alternate Elector, but apparently the Primary Elector declined, so I got a promotion! Can I vote for anyone I want? The Supreme Court ruled that there’s no federal requirement for an Elector to vote as they’ve pledged. In principle, I could vote for whomever I wish. An Elector who doesn’t vote for their party’s designated candidate is known as a “Faithless Elector”. There have been 157 faithless electors since the founding of the Electoral College. (71 of them changed their vote the candidate died in the interim… Republican VP Sherman in 1912, and Democratic Presidential candidate Greeley in 1872). But no Elector defection has ever changed the result of a Presidential election. I’m a fan of the National Popular Vote Interstate Compact (NPVIC), which is a pledge among participating states that their Electors would vote for the winner of the national popular vote, rather than the state popular vote. This would effectively bypass the Electoral College if enough states someday enact it (that is, a set of states that total 270 electoral votes). However, it failed in committee in NC’s lower house (though the NC Sentate passed it in 2007), so that wouldn’t apply to me. Still, I could vote my conscience. In North Carolina, I actually write down the name of my vote on a piece of paper, and I could write Bernie Sanders, Vermin Supreme, Pigasus, or in a passing moment of terrible judgment, Donald Trump. In practice, however, there is a NC law (NC Gen Statute §163-212) that makes it illegal for me (or other Democratic Party Elector) to cast a vote for anyone but Hillary Clinton and Tim Kaine; my vote would be stricken from the record, and I’d be expelled from the Electoral College and fined $500, as well as face censure from the Democratic Party. Overall, probably not worth it. 🙂 But still… let’s see those leaflets! Incidentally, being an Elector is technically an elected office, and it’s exclusive in NC; you can’t hold any other elected office while acting as an Elector, and I’d have to resign any other position. That’s probably one reason I got the job… many other people in the party weren’t eligible. NC §163-209 states, “A vote for the candidates named on the ballot shall be a vote for the electors of the party or unaffiliated candidate by which those candidates were nominated and whose names have been filed with the Secretary of State.” You read that right… in North Carolina, a vote for Hillary Clinton is a vote for Doug Schepers (and 14 other Electors)! Like almost all other states, NC is a winner-take-all election. If Hillary doesn’t win the popular vote in NC, then I don’t get to take a trip to Raleigh on December 19, and I don’t get the $44 a day and 17¢ per mile paid to Presidential electors (per NCGS §163-211.) Vote for Hillary… I need the money! Why is the Electoral College a Bad Idea? I don’t really get 2 votes. Because actually, there is no popular vote for President; there is a popular vote for Electors, per NC §163-209. And while an Elector in NC cannot be a Faithless Elector, other states don’t have that restriction. In Georgia, a Republican Elector vowed not to vote for Donald Trump, the nominee of the Republican Party, which is most likely going to win Georgia. This would be fodder for the conspiracy-minded who think the elections are rigged. Luckily, that Faithless Elector resigned, but it could still happen this election with some other Elector. As much as I want Trump to lose –and I want him to lose badly– I want him to lose fair-and-square. The Electoral College also skews issues and campaigns to focus only on a few key states; the rest of the states are largely ignored, especially reliably Red or Blue states. You’d think that would actually mean that the candidates have to woo a set of centrist states, but it doesn’t work that way… they have to go to the extremes, especially the Republicans (as shown by the Tea Party and Trump), or to drift away from the Progressive view. That is, they have to maintain status quo or play to anxiety and fear. Some claim that the Electoral College is the last firewall against a poorly-informed or emotionally-manipulated populace. To this, I draw attention to Exhibit A: Donald Trump. The Electoral College holds no succor there. I have no deep insights about the negative effects of the Electoral College, other than the received wisdom of others who’ve looked at it. But it adds an unnecessary level of abstraction away from democracy, which raises real questions of the legitimacy of governance that we can scarce afford now. We need people to have faith that their voice matters, or they won’t bother to speak out at all. Among the various controversies and confusions about voting in North Carolina, seemingly designed to impede voters from exercising their franchise, there’s some conventional wisdom about whether or not you can use your mobile phone at the polls. Poll officials are instructed not to allow a voter to use their mobile phone in any way while in or around the voting area, citing NC General Statute 163 Article 14A. I’m not a lawyer, but my reading of this statute leads me to think this is misguided, wrong, and harmful. This interpretation of NC GS 163 should be challenged in court, since it exerts a chilling effect on voting. I’ll run through my interpretation and how it applies to a few scenarios. I welcome comments, questions, and corrections. First, NC Statute 163-165.1 bans voters from receiving assistance at the ballot box except from a close family member or a few other exceptions that require prior arrangement with precinct officials. § 163-165.1. Scope and general rules. (a) Scope. – This Article shall apply to all elections in this State. (1) All voting shall be by official ballot. (2) Only votes cast on an official ballot shall be counted. (c) Compliance With This Article. – All ballots shall comply with the provisions of this Article. (d) Other Uses Prohibited. – An official ballot shall not be used for any purpose not authorized by this Article. Help in the mechanical operations of voting, such as entering or leaving the polling booth, marking the ballot, or submitting the completed ballot. § 163-166.8. Assistance to voters. (1) Any voter is entitled to assistance from the voter’s spouse, brother, sister, parent, grandparent, child, grandchild, mother-in-law, father-in-law, daughter-in-law, son-in-law, stepparent, or stepchild, as chosen by the voter. a. A voter who, on account of physical disability, is unable to enter the voting booth without assistance. b. A voter who, on account of physical disability, is unable to mark a ballot without assistance. c. A voter who, on account of illiteracy, is unable to mark a ballot without assistance. d. A voter who, on account of blindness, is unable to enter the voting booth or mark a ballot without assistance. (1) The person rendering assistance shall not in any manner seek to persuade or induce any voter to cast any vote in any particular way. So, a registered qualified voter may ask for assistance in the mechanical operations of voting (which is good), but the person helping them cannot force or even hint at how the voter should vote (which is also good). As an aside, the law doesn’t impose any expectation that the helper accurately represent the options or record the ballot according to the wishes of the voter, nor offer penalties if the helper doesn’t act in good faith, which seems a glaring omission. This statute clearly prohibits the operational helper from offering advice, but it doesn’t stipulate that the voter can’t seek advice from anyone of their choosing at any time. I ask my wife for advice on local referenda, or to remind me of my own previous voting decisions. This seems to be allowed under any reasonable circumstance, and by my reading of §163–166.8, should apply even in the voting booth if my wife isn’t also providing me with operational assistance. §163–166.8 clearly applies to the conditions of operational assistance only. If the NC General Assembly or State Board of Elections wants a different effect, they should pass a more specific law, not loosely interpret §163–166.8. This means that I should be able to legally use my mobile device to seek advice from anyone I wish, even while in the voting booth. The law doesn’t prohibit me to text someone (but not call, because my conversation could be overheard and interpreted as campaigning), to search the Web, or to consult my own pre-written research which happens to be on my phone (as opposed to a piece of paper). Perhaps there’s some other statute I’m not aware of which prohibits that, but §163–166.8 does not, and shouldn’t be used that way. If it’s your ballot, why can’t you take a photo of it? Wright says it’s to partly protect the vote – and partly to protect you. In another state several years ago, a criminal vote-buying scheme used such photos. Vote-sellers were given cell phones and told to take a picture of their completed ballots to prove they had earned their payment. He says the ban also protects voters from outside pressure. Several years ago in Italy, Wright says, members of the Mafia were told to bring back photos of their ballots to prove they voted for the candidates supported by their crime syndicate. Wright says without the photo ban, an unscrupulous employer could exert the same type of pressure here in North Carolina. This is a legitimate concern, and a plausible rationale. I might differ on whether this is the right solution to the real problem, but I don’t see this as a impediment to the voting process itself. § 163-166.3. Limited access to the voting enclosure. (b) Photographing Voters Prohibited. – No person shall photograph, videotape, or otherwise record the image of any voter within the voting enclosure, except with the permission of both the voter and the chief judge of the precinct. If the voter is a candidate, only the permission of the voter is required. This subsection shall also apply to one-stop sites under G.S. 163-227.2. This subsection does not apply to cameras used as a regular part of the security of the facility that is a voting place or one-stop site. If you can’t photograph your ballot, then a prospective vote-buyer can’t verify that you voted the way they wanted (of course, it’s no guarantee anyway: you could simply photograph your ballot with their chosen votes marked on it, then request a replacement ballot that you use to vote the way you actually want). I’m not sure what “any purpose not otherwise permitted under law” means; what are the permitted purposes for photographing a ballot? I don’t know enough legal convention to track down the references at the end of the clause that might have shed light on that. So, you can’t use a camera in the “voting enclosure”. Just what is the legal definition of a“voting enclosure”? (8) “Voting booth” means the private space in which a voter is to mark an official ballot. (9) “Voting enclosure” means the room within the voting place that is used for voting. (10) “Voting place” means the building or area of the building that contains the voting enclosure. So, the voting enclosure referred to in §163–166.3 refers to the rooms set aside for voting, while the booth itself is where you mark your ballot. Can I take a photo of people intimidating others or otherwise suppressing voters? Yes! You can take a photo of anyone outside the “voting enclosure”, and since it’s illegal to do campaigning inside or directly around the voting enclosure, or to be inside the voting enclosure except while voting, any photo you take of someone intimidating others in the area outside is legal. § 163-166.4. Limitation on activity in the voting place and in a buffer zone around it. (a) Buffer Zone. – No person or group of persons shall hinder access, harass others, distribute campaign literature, place political advertising, solicit votes, or otherwise engage in election-related activity in the voting place or in a buffer zone which shall be prescribed by the county board of elections around the voting place. In determining the dimensions of that buffer zone for each voting place, the county board of elections shall, where practical, set the limit at 50 feet from the door of entrance to the voting place, measured when that door is closed, but in no event shall it set the limit at more than 50 feet or at less than 25 feet. I’ve been trained as a non-partisan Voter Protection poll watcher, and I plan to go to a smaller town in NC to help ensure fairness at the polls. I took extra training to help deal with possible organized voter intimidation, and one of the main takeaways was not to confront anyone or try to de-escalate the situation, but simply to document it and call the Election Protection Hotline: 888-OUR-VOTE | 888-687-8683. So, take photographs of anything suspicious, but protect yourself and be safe. Caveat: There may be voter suppression happening in the voting enclosure, though we hope it’s rare. The poll workers might not be dealing with it properly, or the intimidation or suppression may be coming from the poll workers themselves (e.g. turning away voters that don’t have photo IDs, not offering provisional ballots, etc.). 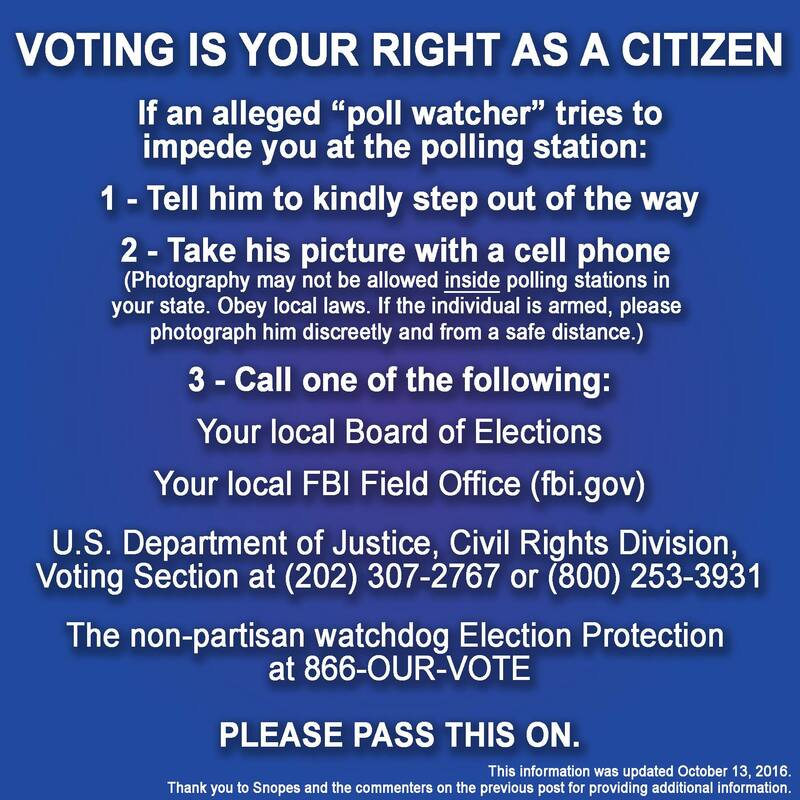 It’s still illegal for you to photograph incidents of voter suppression inside the voting enclosure! Don’t do it. You can ask names, take notes, or record information in other ways, but you can’t take photographs. Immediately call the Election Protection Hotline (888-OUR-VOTE | 888-687-8683) and report the incident. Can I take a photo of my completed ballot in North Carolina? Can I post a ballot-selfie on socials? No. That’s still illegal in North Carolina and many other states. This has been changing in some states, though, so it might also change in North Carolina. 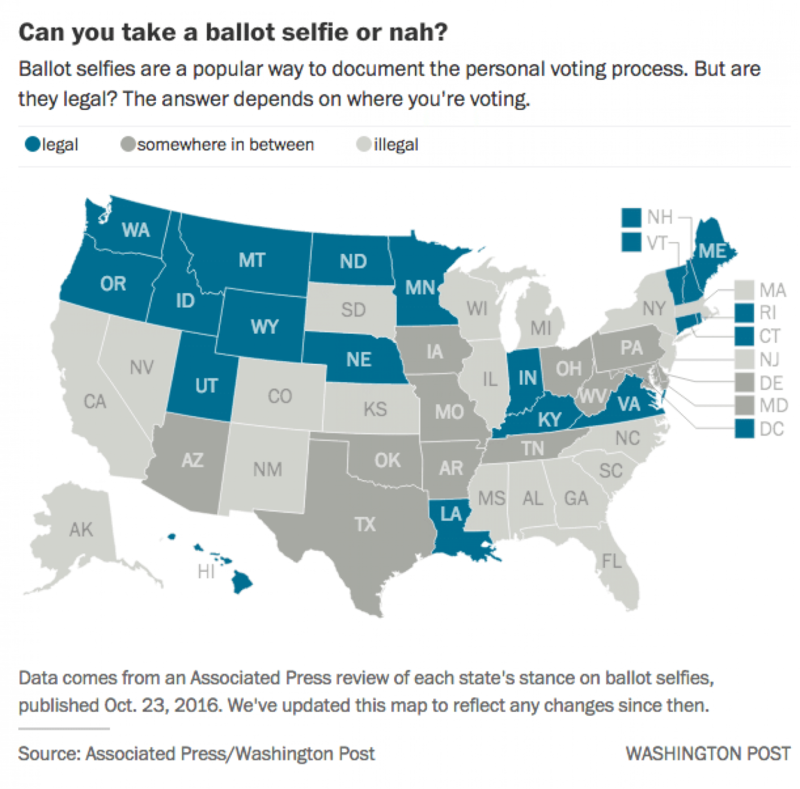 The Washington Post has an up-to-date list of the legal status of taking ballot-photos for all the states. Can I use my phone to look up my voting choices? Yes. There seems to be some gray area here, so you might want to be discreet –getting your vote cast is the most important thing– but this seems to be legal. There have been incidents in NC of poll judges saying this is illegal, or even posting signs saying it’s illegal. I’ve seen this happen myself even in the progressive stronghold of Chapel Hill. I think this is due to bad training of poll officials. Even though this should be legal, you might be confronted by poll officials telling you to turn off your phone. If this happens, ask them to let you step outside the voting enclosure and write down your voting choices (or prepare a paper list in advance). This ambiguity is insidious, because it largely targets younger voters, who are more likely to rely on smartphones for this as they do for other tasks, and who are less likely to vote. We should reduce barriers to younger voters, not put up walls against democracy. Can I use my phone to text others for advice? Can I access voter guides on the Web? I don’t know. My opinion is that you should be able to, but that’s not a legal opinion, and it’s not based on any reading of any specific statute. My advice is to get a sample ballot outside while you’re waiting in line (there are likely to be partisans handing these out), and do any phone calls or texts or web browsing for advice before you enter the voting enclosure. This also decreases the wait time for others in line, ensuring everyone has an equal chance to vote.